The Lenovo Miix 2 10 manual aka user guide is available now. For owner of this laptops, you can download the manual directly at lenovo official website. There is important information in the manual for example about how to connecting, recoverys system and troubleshooting problem. The Lenovo Miix 2 come with main specs and features such as powered by Intel Atom Z3740 Processor Quad Core (1.33GHz, 2MB), installed Windows 8.1 32 operating system, available is 2GB LPDDR3 1066 MHz (on board), equipped with 5M rear cameras and 2.0M front camera, it has 10.1" Full HD display screen with a resolution of 1920 x 1200. In addition also storage support: Up to 128GB integrated eMMC and Up to 32GB add-on Micro SD card. 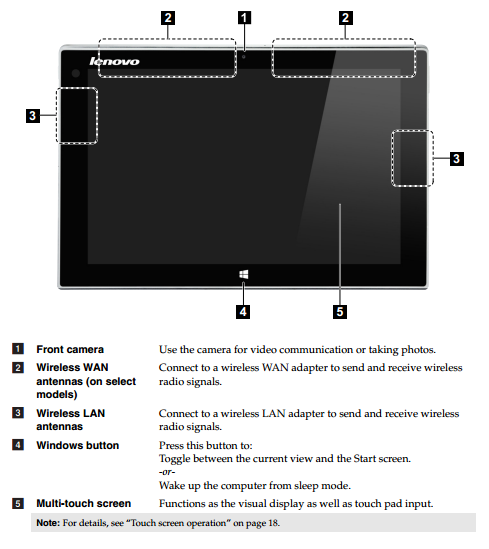 The Lenovo Miix 2 user manual available n english language. It's consisting of 34 pages. It's devided into 4 chpter. The manual contains reference information such as laptops layout an dkey functions, Configuring the operating system for the first time, Operating system interfaces, how to Putting the computer to sleep or shutting it down, Touch screen operation tips, Connecting to a wireless network. When I turn on the computer, nothing appears on the screen. The critical low-battery error message appears, and the computer immediately turns off. The screen is unreadable or distorted. Incorrect characters appear on the screen. the battery status icon shows it is empty. The Microsoft® Windows operating system does not start. Failure to restore system partition to factory default. What safety precautions should I follow when using my computer? Where can I find the hardware specifications for my computer? Where can I find drivers for the various hardware devices of my computer? How can I contact the customer support center?